Weird Sisters, by Eleanor Brown, is next up on our 100 Bestsellers List reading challenge. For a synopsis of the book, check out Roberta’s Writer’s Review. – The main characters – the three sisters, Rose, Bean, and Cordy – were stereotypical. Why was it the youngest who was irresponsible and became an unwed mother? Wouldn’t it have been more interesting for the eldest, responsible Rose, to make some crazy mistake and be the unexpectedly pregnant daughter? – The plot was slow and boring (was there a plot?). Mom has cancer, so all the sisters come home ostensibly to take care of mom, but in actuality to hide from and ultimately resolve their secrets. There were small moments of despair and moments of success, but nothing momentous. – The ending was predictable (halfway through it I guessed correctly how things would end up for 2 of the 3 sisters). Also, as Roberta mentions in her review, the narration is written in the omniscient first person plural, as the voice of the combined sisters, which I found confusing. I was never quite sure if just one sister was speaking or if they were narrating as a combined sisterhood. It was unique, but just didn’t work for me. As I was reading, I kept asking myself why this book was chosen by the computer algorithm from The Bestseller Code. I certainly wouldn’t have considered it a bestseller. Since I seem to be having similar thoughts about several of the books we’ve read, I’ve decided to reread The Bestseller Code. Hopefully now that I’ve read 12 of the books on the list, reading the book another time and reviewing how the list was created will make more sense and lead to a better appreciation of the subsequent books we plan to read here at The Bestseller Code Reading Challenge. The next book is number 87. World War Z by Max Brooks (2006) – Discussion begins May 8, 2017. This book is categorized as Horror or Apocalyptic Horror. What it’s about: Three grown sisters return to their hometown when their mother falls ill. Although they grew up together and all were named after characters in Shakespeare’s plays by their father, the three sisters couldn’t be more different. Will the crisis pull them together or break them apart? The three sisters are the main characters, and they share the mantle more or less equally. They are — in birth order — responsible math instructor Rosalind (Rose), chic New Yorker Bianca (Bean), and transient hippie Cordelia (Cordy). Their mother serves as impact character. Because of events that happen to her, she drives the plot. When she develops breast cancer, the sisters return to their childhood home to be with her. Later, another trip to the hospital changes the dynamic between the sisters. Interestingly, the mother remains unnamed through the novel. She is simply “mother.” Because she appears to drive the plot without having much other relevance, she could be called a MacGuffin. Their father, James Andreas, is a professor who teaches Shakespeare at the local college. In the novel, he serves as a contagonist of sorts, reacting strongly when Cordy reveals she is pregnant. The novel is set in the fictional town of Barnwell, Ohio. 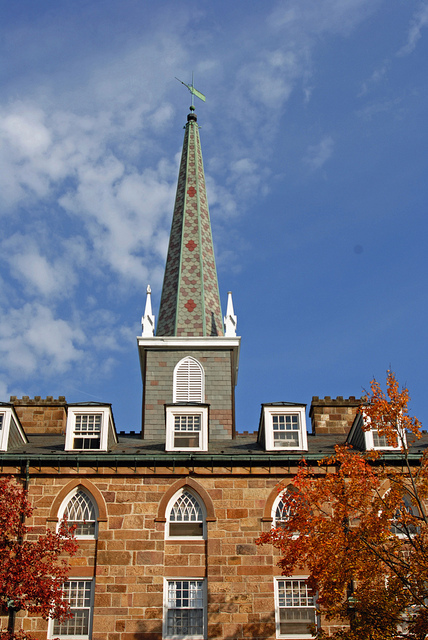 It is a typical small Midwestern college town where the faculty and students outnumber the local residents. Rose’s dream is to land a permanent position at the college. As in most small towns, the residents have known each other for a long time. Their pasts intertwine. We see stories in magazines or newspapers sometimes, or read novels, about the deep and loving relationship between sisters. Sisters are supposed to be tight and connected, sharing family history and lore, laughing over misadventures. But we are not that way. We never have been, really, because even our partnering was more for spite than for love. As the book progresses and the sisters mature, however, the first person plural starts to fade somewhat as the narration follows each sister. Is it because they have now established their own identities or because the author tired of it as a device? I suspect the former. Have you read the book? What did you think of the first person plural voice? The main theme of the book explores how birth order effects the sisters and their destinies. Even the title refers to it, because the word “weird” takes on the older meaning of its origin word, “Wyrd” or fate. Are the sisters’ fates determined by birth order or can they break free? A lesser theme is that of stealing or theft. Each of the sisters steals something during the course of the book. Bianca (Bean) is the only one who commits a serious theft and is caught, but even she isn’t made to face severe consequences. She’s merely asked to pay back the money she stole and loses her job. Why do you think the sisters steal? How does it reflect on their characters? Their Midwestern upbringing? Reading The Weird Sisters really drives home how different all the novels on this list are. This one is a sweet, close examination of the relationship between three sisters. How did it end up on the same list as the next book, a horror novel about zombies? Perhaps it is time to revisit The Bestseller Code (reviewed here) and see what traits the authors used to pick the novels on the list. Quirky fact: This book is written in the first person plural. Have you read The Weird Sisters by Eleanor Brown? We’d love to hear your thoughts. Have you written about The Weird Sisters by Eleanor Brown? Feel free to add a link to your review here. 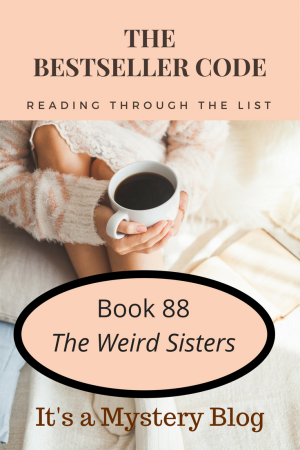 Today we’re looking forward to starting the next book in The Bestseller Code 100 challenge, Eleanor Brown’s The Weird Sisters for Book Beginnings on Fridays. We came home because we were failures. Cordy had never stolen anything before. As a matter of pride, when our friends were practicing their light-fingered shuffles across the shelves of Barnwell’s stores in our teens, she had refused to participate, refused even to wear the cheap earrings and clumpy lipstick or listen to the shoplifted music. But here she was in this no-name desert town, facing off against the wall of pregnancy tests, knowing full well she didn’t have the money to pay for one. A Wild West shootout: Cordy versus the little pink sticks at noon. I remember seeing reviews of this one when it came out. The third person plural voice intrigued me, but I never picked it up. What do you think of the tone of the first paragraph.? Would you want to read more? Aside: There’s an interesting essay about our interest in the first line of novels at Electric Lit. The author suggests our obsession over the first line is a relatively new phenomenon and may have had it’s roots in the rise of product advertising. He also discusses how the first sentence varies between genre fiction and literary works. In the end he concludes that there’s a danger of putting so much emphasis on having a knocks-you-socks-off first sentence that it will become “orphaned” from the rest of the novel. Perhaps simple is better.